Silver beech seeds (top) are about 5 millimetres long and roughly oblong. The tips of three narrow wings extend above the body of the seed. 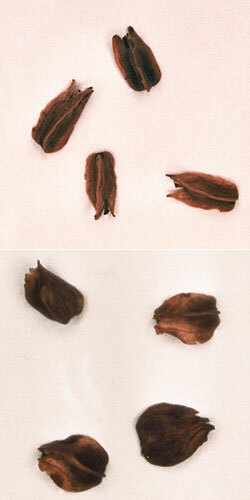 Red beech seeds (bottom) are about 7 millimetres long and oval. The wings are broad at the base of the seed and taper to a point.